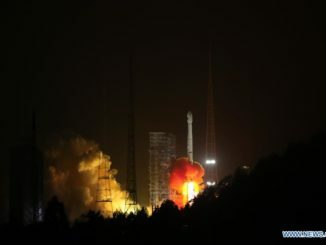 Less than two days after launching from southern China, the Tianzhou 1 supply ship glided to an automated linkup with the Chinese Tiangong 2 space laboratory around 240 miles (385 kilometers) above Earth on Saturday, ready for several months of technical demonstrations to prepare for assembly of a space station in the next few years. The Tianzhou 1 cargo craft, about the size of a double-decker bus, docked with the Tiangong 2 module at 0416 GMT (12:16 a.m. EDT) Saturday after an autonomous computer-controlled rendezvous. A docking ring between the two craft retracted a few minutes later to create a firm connection as they sailed over Chinese ground stations. 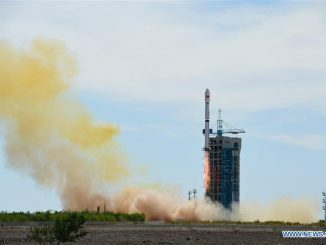 The high-altitude linkup occurred after a journey from Tianzhou 1’s launch pad at the Wenchang space center, a modern facility on Hainan Island in the South China Sea. China completed construction of the launch complex in 2014 and conducted the first launches there last year. 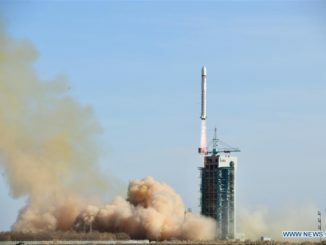 Tianzhou 1 blasted off on top of a Long March 7 rocket Thursday and reached a preliminary orbit around 10 minutes after liftoff. The craft’s on-board thrusters fine-tuned its orbit for final approach to Tiangong 2 over the last two days. The robotic supply ship will pump propellants into the Tiangong 2 mini-space station, which launched last year and hosted two astronauts for a month-long stay in October and November. The refueling experiment will validate key technologies China needs to build and maintain a much larger orbital complex starting as soon as next year. The multi-piece space station should be completed by 2022, when it will be ready to support three-person crews for expeditions lasting as long as six months. China has not released a timeline for the refueling tests, but officials said Tianzhou 1 will dock with Tiangong 2 three times and remain with the space lab for two months, then spend around three months in solo flight conducting more experiments before re-entering Earth’s atmosphere later this year. Chinese engineers consider the refueling demonstration one of the final major tests before kicking off construction of a permanently-staffed space station due to be complete by 2022. Transfer ports located around the docking mechanisms on both spacecraft will be used to route liquid propellants from Tianzhou 1’s storage tanks into the Tiangong 2 space lab. 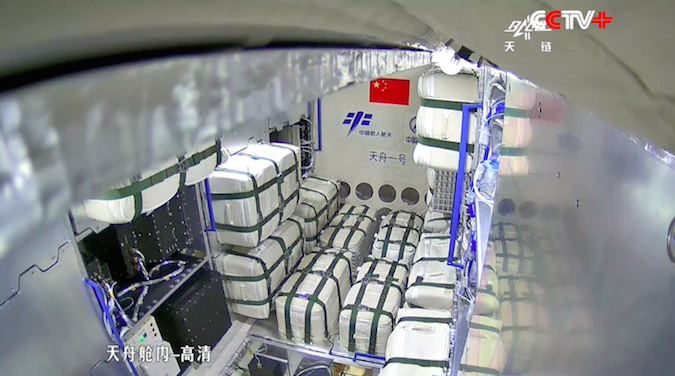 According to the government-managed Xinhua news agency, ground crews packed a “test load” of items inside Tianzhou 1’s pressurized cabin, simulating the equipment a three-person crew would need for one month in space. The payloads include crew provisions, water tanks and oxygen and nitrogen vessels designed to replenish the space lab’s breathable atmosphere. With a launch mass of nearly around 28,460 pounds (12,910 kilograms), Tianzhou 1 is the heaviest spacecraft ever launched by China, slightly bigger than the Tiangong 2 space lab itself. The Tianzhou 1 spacecraft measures around 34.8 feet (10.6 meters) long and 11 feet (3.4 meters) in diameter. Once in orbit, the spaceship extended its power-generating solar panels to a span of approximately 49 feet (15 meters) tip-to-tip. Chinese officials said last month that the core component of the country’s space station will launch on a heavy-lift Long March 5 rocket some time in 2018. The Tianhe 1 module will be joined by China’s second supply ship, named Tianzhou 2, for a cargo delivery before the first astronaut crew visits the orbiting facility aboard the Shenzhou 12 spacecraft. Two more modules will be added to the space station by 2022, completing assembly of a complex that is expected to have a mass of more than 60 metric tons, about one-seventh that of the International Space Station, and comparable to the mass of NASA’s Skylab station in the 1970s. Other research investigations will study the proliferation and differentiation of human embryonic stem cells into germ cells to gather data on the possibility of human reproduction in space, Xinhua reported.